Gareth D. Jones has been managing hazardous waste for 17 years, much of that time while working at pharmaceutical R&D establishments. He has a degree in Environmental Science and likes to entertain his family on days out by pointing out different wheelie bin sizes. His stories have appeared in numerous magazines, including Nature, IGMS and Daily Science Fiction and in 26 languages. He claims to be unofficially the second most translated science fiction short story author in the world. You can find him at www.garethdjones.co.uk. A lot of people don’t give much thought to their waste (or rubbish or garbage depending on where you live). They just throw it out and somebody else takes it away. People are generally more aware of recycling, resource efficiency and sustainability than they used to be, but still have little idea how that works in practical terms. 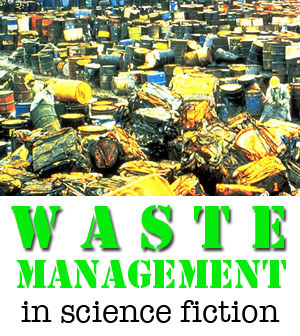 Most writers probably give the topic of waste management little thought too, unless your story happens to be about the mutating power of toxic waste, but as with many other aspects of everyday life it can be something that appears in the background of your story and add an important detail to the society or ambiance you’re going for. If you’re writing a story in a post-apocalyptic, dystopian or steampunk setting or in a ruthless dictatorship where slave labour is used for menial jobs, then feel free to write anything you like. If you’re writing something contemporary or set in the future though, it would be nice to see something based on current technology or an extrapolation thereof rather than something hopelessly outdated that makes me want to send you an email and offer to take over the Total Waste Management contract for your galactic empire and bring it into the 21st century. We all love the scene in Star Wars with the garbage compactor, and the time the Millenium Falcon hides among the garbage being jettisoned from the super star destroyer. 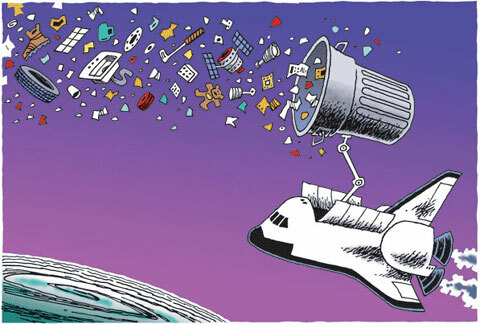 But, we have to ask, could a closed system like a space station or starship, or a society in general, afford to throw away that amount of material into space? When the Enterprise in Star Trek Into Darkness turned out also to have a garbage chute to jettison huge quantities of material into space, I watched on in disbelief, not at Kirk and Spock’s highly dangerous flight, but at the ridiculous waste. That material should be recycled onboard or stored up to be returned to a planetary base to be recycled. The cost involved in getting anything into orbit makes it far too valuable to throw away when it could be easily returned to Earth on a returning shuttle. Wall:E was even more preposterous. How could they be throwing that amount of waste into space if the ship was mankind’s only home for centuries? The volume of material being thrown out would probably have amounted to the entire mass of the ship after a few decades. Materials are not infinite. Please give some thought to where they came from and where they go when they’re finished with. Please don’t either throw your waste out an airlock or have a laser waste bin vaporise it. In an episode of Dark Matter I half watched recently, the team were imprisoned on a space station and some of them were sent down to the waste department to work. Here they were sorting the waste for recycling (hurrah!) and sending the rest for incineration. The waste was on a conveyor belt being hand picked. That’s getting rather old-fashioned even now. Optical and magnetic sorting mean many waste streams can be sorted mechanically and this would surely improve in the future. Admittedly, this was a punishment detail so was perhaps deliberately labour intensive. Next they had to wheel the residual waste on trolleys into a large incinerator room. That was ridiculously inefficient. Of course, somebody then shut the door, locking them in, and turned on the incinerator. Who designed that system? Did nobody carry out a hazop study when they were designing it? What mad man would design a system that allows a good chance of death for the operators? I’ve managed hazardous waste incinerators in the past. Every system has an alarm, a backup, an alarm for the backup and a backup for the alarm. There are safety interlocks, emergency stops and nothing designed to allow the operator to be incinerated. When you’re designing your Imperial Galactic incinerator, or any other technology, don’t just throw in a convenient way to put your hero in mortal peril. Imagine you’re the system’s designer (which you are) and design it properly. Then come up with a more convincing way to threaten your protagonist. In an episode of CSI, a murderer admits to having dumped a body in an old quarry. When they arrive, the quarry has been tuned into a landfill. The operators never found the body because they drained the water and just started throwing waste in. Landfills are not just a hole in the ground. They’re specially engineered with impervious lining, venting systems for gas and pumping systems for leachate. They would have found the body while constructing the landfill. 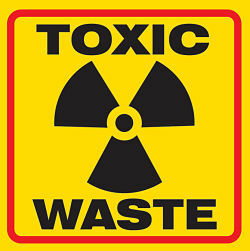 I’ve been working with hazardous waste for 16 years and so far it’s failed to mutate me into any kind of super hero. Which is a shame. Mutagenic and teratogenic waste can cause mutations in cells or in embryos, but the other hazards associated with them mean that even if you bathed in the stuff you would likely die from toxins before you were to mutate into a sentient samurai tortoise. Sadly, radioactive waste doesn’t glow. If somebody has been exposed to radiation and developed radiation sickness, this does not automatically make them radioactive. The kind of radioactive waste I’ve dealt with is Very Low Level waste from research labs rather than nuclear power plant waste. Either way, the important thing to remember about protecting yourself from radioactivity is Time, Distance and shielding. Minimise the time you spend in contact, maximise the distance, and get some shielding. I can’t go into all the complexities of half-lives, radionuclides and the effects of alpha, beta and gamma radiation, but if you’re going to use radioactivity it’s worth getting an idea of what’s involved. Biohazardous waste could be a number of things: bodily fluids and body parts, GMOs, cell samples, agar plates and the like infected with a disease of some kind, gloves and wipes etc contaminated with biological agents, needles and other sharps infected with the same. They don’t all automatically need full body suits to protect you from them, and they won’t all kill you on contact. A lot of research labs and hospitals put their biohazardous waste through an autoclave to kill off anything dangerous, so piles of waste waiting to be collected may already be harmless. Chemicals come with a fabulous variety of hazards: corrosive, flammable, toxic, irritant, harmful, spontaneously combustible, oxidising, explosive. Mixing them together can cause dramatic reactions, so generally all of the different hazards are stored separately, even while awaiting disposal. Unless you’re a chemist (which I’m not) it’s very difficult to know which chemical will react in what way, but there’s such a huge number of possibilities that it’s worth thinking of some dastardly and original way to feature chemical waste in your plot. Remember, in the future not everything will be made of plastic. Give some thought to the resources your society consumes and what they do with the waste. And unlike in real life, have fun playing with toxic waste!